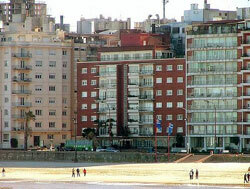 The affluent neighborhood of Pocitos (a prime area) is characterized by 10- to 15-storey apartment buildings along the city’s famous Rambla, or coastal promenade. When it comes to swimming and recreation, residents have the choice of the Río de la Plata and the Playa Pocitos. Pocitos is also home to two lavish shopping malls, Montevideo Shopping and Punta Carretas Shopping. The Rambla is Montevideo’s famous beachfront walkway along the Río de la PlataSmall shops and restaurants serving international cuisine are arrayed along it. La Rambla is largely an affluent neighborhood with beachfront properties and furnished apartment buildings.